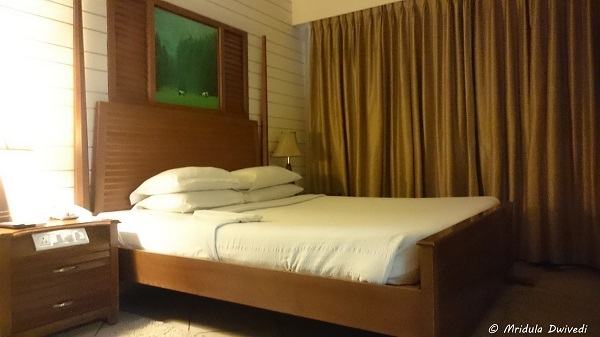 I spent one night at Sai Vishram Business Hotel Bangalore in the Bommasandra Industrial Estate. I was not sure how will it go but I had a lot of fun t the business hotel as well. Actually many families were staying there. As it is a business hotel I expected a gym and a swimming pool but nothing beyond it. 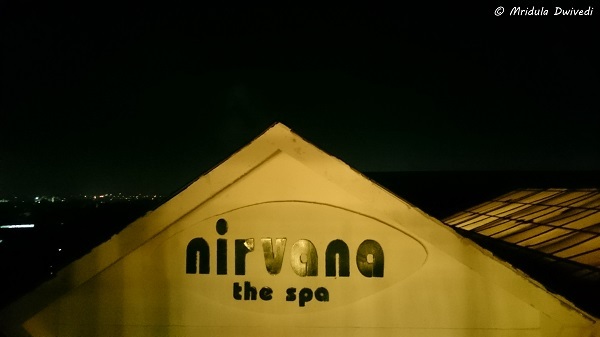 So discovering Nirvana Spa was a bonus. But let me start at the beginning. 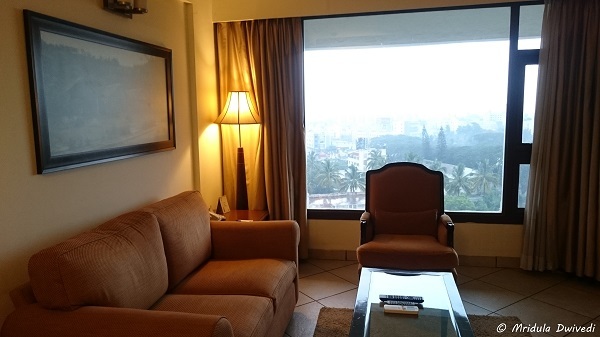 When I arrived after a fast check-in I had a suite at my disposal on the 8th floor. There was a plenty of tea and snacks in my room. I had a pleasant view of the city from my room. And if you are worried about the beehive my room was entirely closed, the bees could not have entered my room. After spending an hour in the living area of the suite which I spent in trying out all the snacks and drinking tea, I decided to venture out. I was escorted to the Nirvana Spa where I had the luck to meet the consulting doctor Hitha Shetty. She looks much younger in person that on the website picture! I had previously talked to her on phone from Balkatmane but meeting her was so much more fun. She told me about the philosophy of ayurveda and how inspired she is about the work she is doing! I went in for a pedicure at the Nirvana Spa. It was once again completely organic using lemon, oats, salt, scrub and olive oil. I was chatting with the two ladies doing the pedicure. 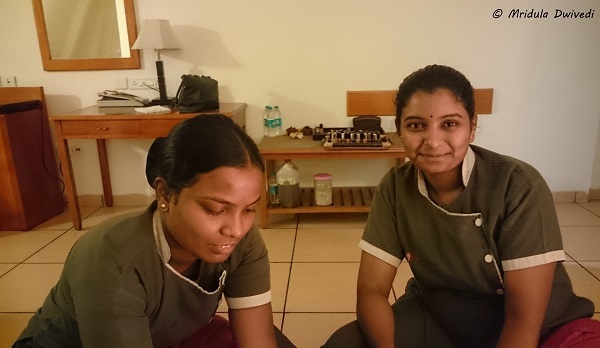 Their names are Roopa and Rathna and we did a general chit-chat. Roopa (on the right) could speak English and she surprised me after a while by saying, “Ma’am you are very nice, you talk to us. Everyone else, they come get the treatment done and go away.” I was truly surprised! I can chat to almost anyone! The hotel has a gorgeous roof top swimming pool. But the day I was there it was raining a lot in Bangalore, otherwise I would have surely gone for a swim. The business hotel was my last stay with Sai Vishram. I stayed at their beach resort, spa and RV. At all the places there was good food which they believe in feeding to their guests! I really needed that swim but the weather had other ideas. 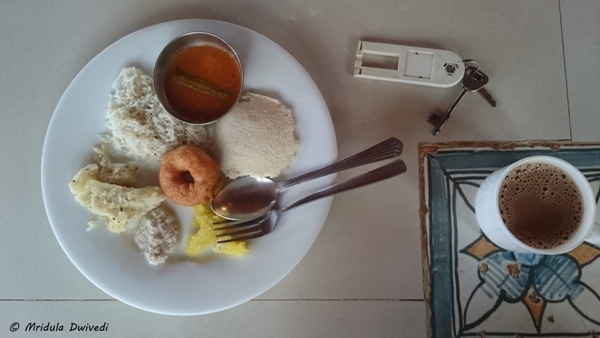 The food at the Sai Vishram Business Hotel was excellent too. They had a lot of South Indian delicacies but they also had stir fried and tossed vegetables too. 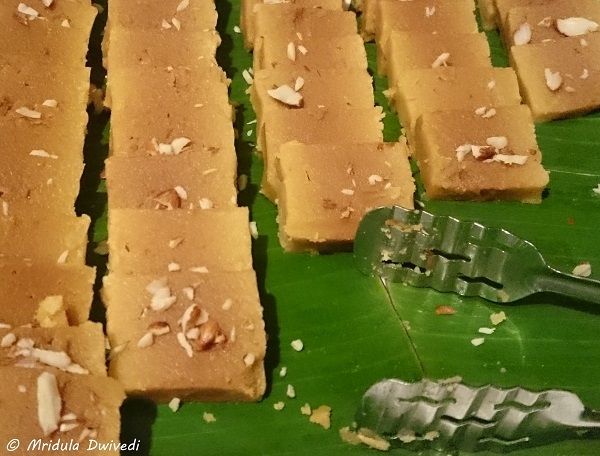 And when I see Mysore Pak I have to eat it, calories be damned! And these were so tasty. One of my school friends joined me for dinner, I met her after 25 years! Needless to say that made the stay doubly special. Eventually late in night my friend left for her home! And I managed to crash for a few hours! When the alarm went off at 3.00 am I had such a strong inclination to ignore it but then I had a flight at 6.00 am and I dragged myself off somehow to go to the airport. PS. I was invited by the Sai Vishram Group on this trip. When I realized at the Delhi Airport that the Air India aircraft that was supposed to fly from Delhi to Mangalore was not cleared by the maintenance, I was worried about my trip. However after two hours of delay they found another aircraft to take us to Mangalore. 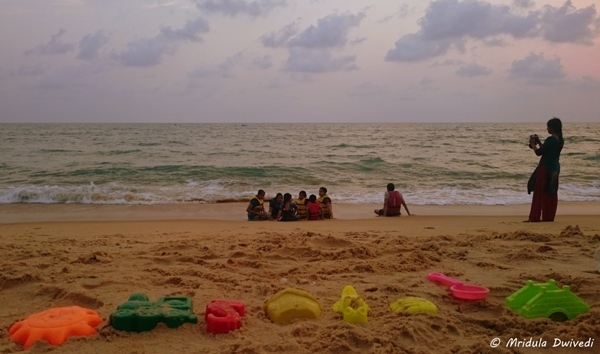 And that is how I had a fabulous time at Sai Vishram Beach Resort in Byndoor, Coastal Karnataka. 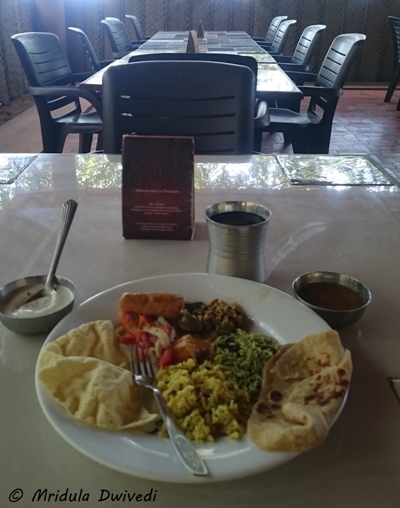 It is a resort that serves only vegetarian food and it doesn’t serve alcohol. And yet they are so popular for family vacation! I arrived at the Sai Vishram Beach Resort by evening. it was an overcast day. I was so tired that when Adarsha the resort manager asked me if I would come by the beach for the evening tea, I replied in the negative. 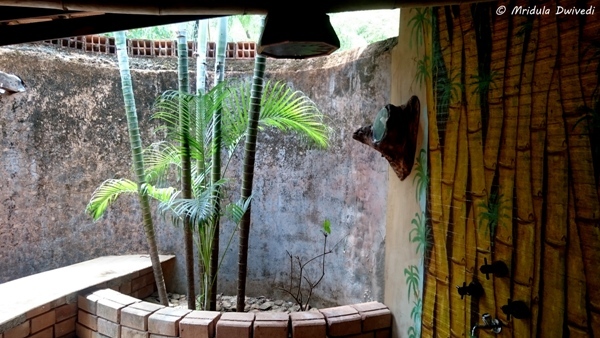 I had my tea and samosa sitting in the balcony of the earth cottage. I could gaze at the sea in far distance and I was content. Later I shifted to one of the sea cottages by the beach. Both have their own advantages. In the Earth Cottage there was a rose apple tree right in front of my room and I could eat the fruit straight from the tree! I loved the outdoor bathing area of the sea cottage. In the end I would take the sea cottage because I could go to sleep to the sound of the sea out there. 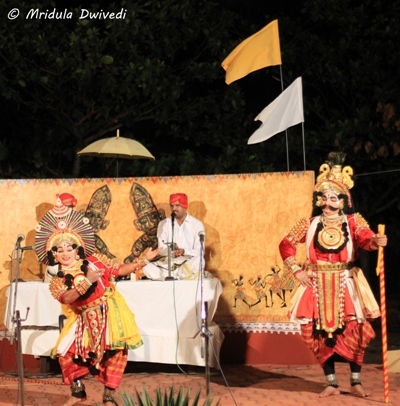 In the evening there was a yakshagana performance happening in the open theater within the premises. 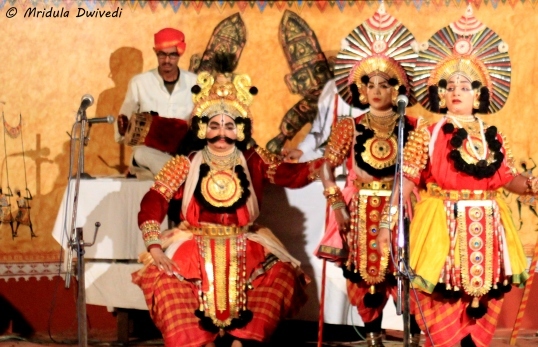 Yakshagana is the folk art of Coastal Karnataka, it is usually held from dusk to dawn. The resort performance was of one hour. As it was in the local dialect, Kannada, I could not understand the language much. But it was a privilege to watch the act of Arjun and Sudhanva and Lord Krishna being played out in elaborate costumes. The story is about Sudhanva holding the horse of Arjun so that Arjun and Lord Krishna would come to his kingdom and he would get to see the Lord. In the end you don’t need words to enjoy the art. I thoroughly enjoyed my time watching the performance! From the open theater I straight headed to the dining area. Sai Vishram serves excellent vegetarian food, night, morning and noon! 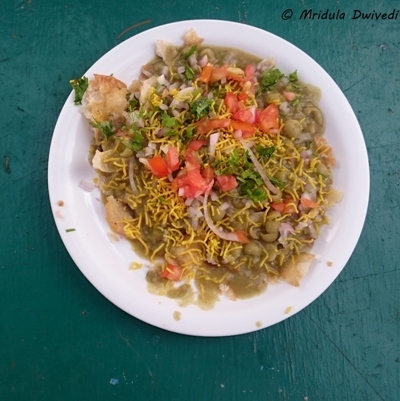 They have a variety of food, including noodles and at least one North Indian dish. There would be many South Indian dishes. I liked the idea of having a nice fruit section for dessert apart from traditional desserts. The best was that they kept an ice cream fridge for the guests where you could go out and take out any ice cream that caught your fancy. It was hugely successful with the kids. The artists who performed the yakshagana were having dinner at a nearby table in their normal clothes and I could hardly recognize them as the same who were performing in the elaborate costumes! They would serve the evening tea and snacks by the beach, which I loved. They would put pitchers of fresh juice on the beach during the day which was another lovely idea. I crashed early after dinner and took my own sweet time to wake up the next day. That way I quite fresh in the morning again. After a heavy breakfast I went to the sea. 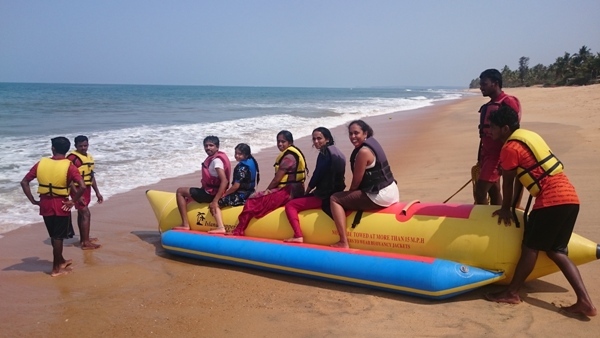 I met Prashanth and his family and together we went on the banana boat ride. 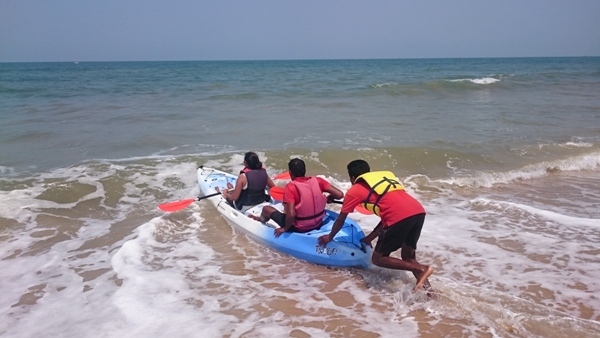 That is when I discovered Chandravati, the dare devil female water sports instructor of Sai Vishram. I then went on the jet ski with her. She rides like really fast! She truly is an inspiration. Then I tried my hands at kayaking and it was fun too. There are many other water activities that I could not try dues to lack of time. The next day I woke up at 6.00 am to take a walk to a vantage point and see the sunrise. We must have walked for about a kilometer to reach the point. 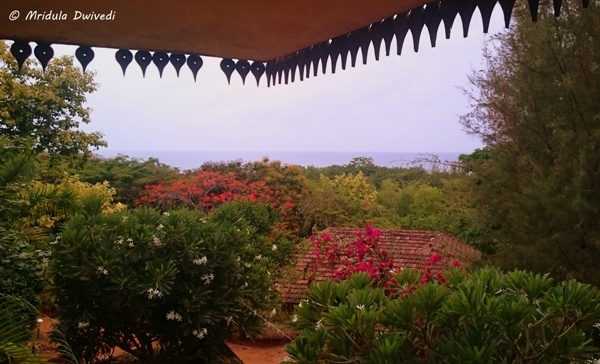 The view was excellent, after all I do not get to see the sea meeting the backwaters everyday! But the sun played truant, there was no sunrise, the clouds ruled. 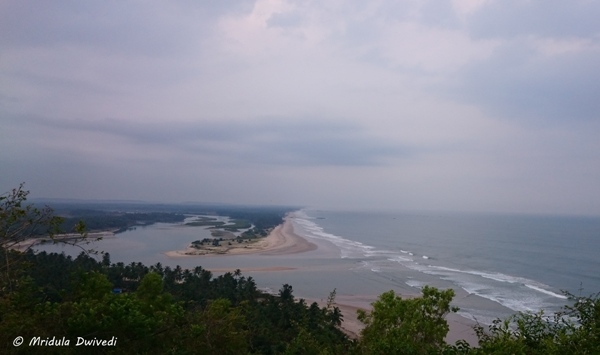 After going there, I would recommend that you go to the vantage point even on an overcast day as the views are still stunning. I love sunsets by the beach. The location of the resort is such that there are only the house guests on the beach. I spotted an occasional other person from the fishermen families living nearby. I could see a few houses nearby otherwise the whole place was green and silent. The sun was merciful the second evening and gave much cheer to people on the beach! 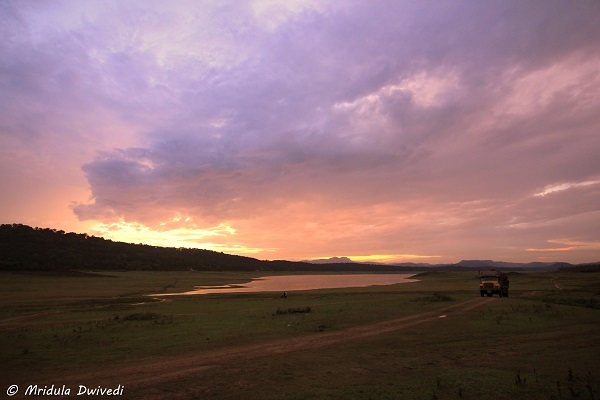 This was my first tryst with Coastal Karnataka and I never imagined it to be so beautiful. I wonder why tourism has not developed around the coast like Kerala! PS. I was invited by the Sai Vishram Group on this vacation. 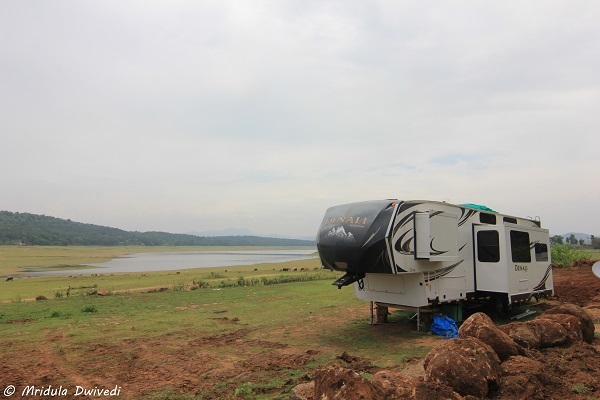 When I saw the camping trailer and the location of the Harangi Backwaters near Kushal Nagar, Karnataka, I immediately forgot how tired I was! We started at 6.30 am from Balkatmane Spa but here I was all my tiredness completely forgotten! I was excited about my camping holiday with Sai Vishram. I was behaving like a school girl when I went inside the caravan! I explored all the nooks and corners at one go! Denali by Dutchmen is a home in itself! 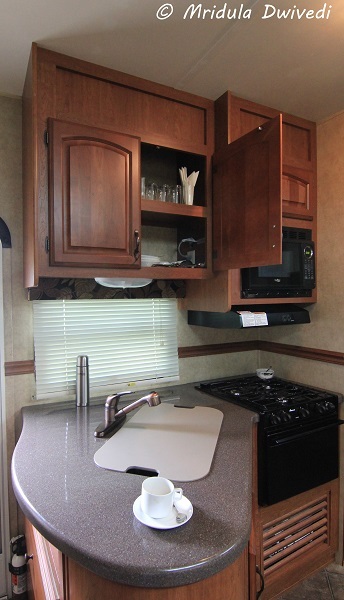 It has a large living area with kitchen and TV. There is a master bedroom, two bathrooms and another smaller living area. 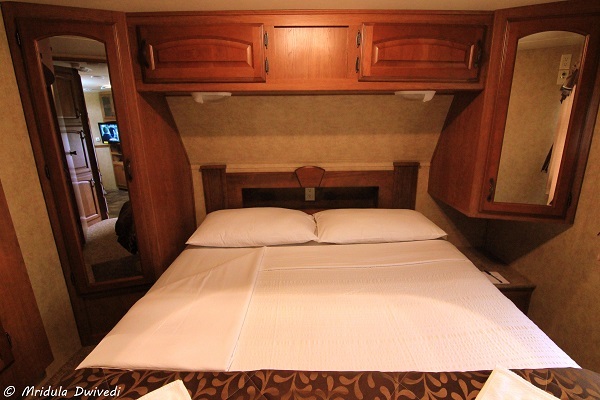 There is a bunk bed in the smaller living area as well. The sofas unfold as beds too! 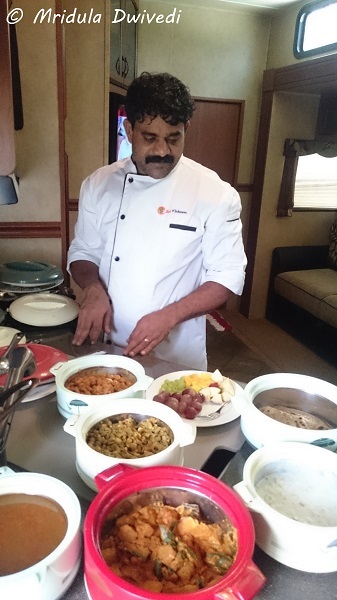 While Denali is fully equipped with a kitchen Sai Vishram does the cooking in a house adjacent to the trailer. Narayan not only made good food, he was very fond of feeding the guests as well. He was quite disappointed with me as he said I ate nothing! On the other hand I thought he fed me till I would burst at the seams! As he lived in Mumbai for a long time, he spoke Hindi quite well. And all that was food for one! 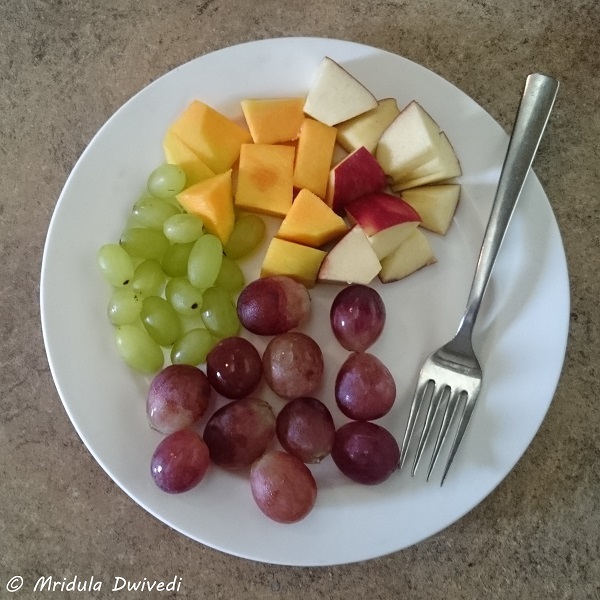 After a heavy meal, thankfully he would give me fruits for dessert! He sensed that I liked fruits so he increased the quantity later on! He also correctly sensed that tea was the way to keep me happy after I asked for the first cup. Then it would materialize on its own, I never had to ask for tea again. The weather was lovely the day I stayed there. I was frequently switching between staying indoors and then getting out to enjoy the view! After lunch the staff retired. I had the huge RV all to myself! I noticed that a lot of cattle come to graze to the campsite. Harangi Backwater is also popular with the locals. Someone or the other would trickle in at all hours of the day! After the siesta it was time to go for an evening walk! 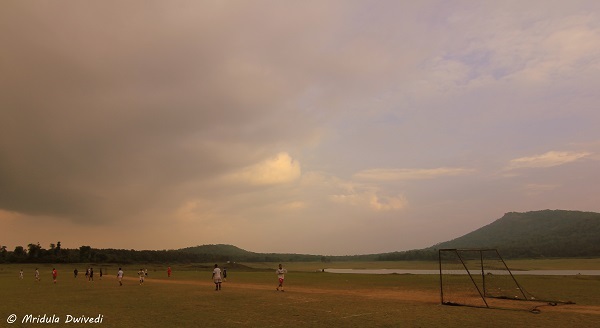 While I was there a football game was in progress and I have to say this was one of the most scenic local football grounds I have ever scene. I immediately remembered my younger nephew Sunil, as he would have been thrilled to be a part of it! There were monks out there in numbers as well. 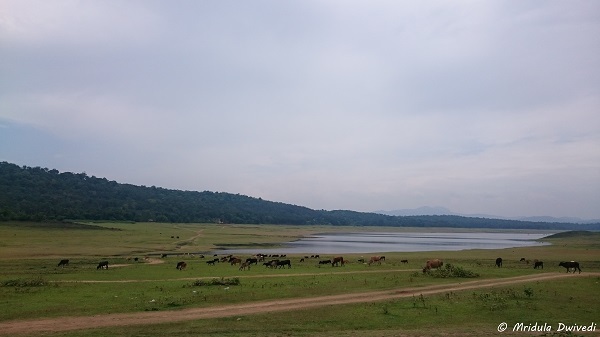 On investigating I was told that Bylakuppe Monastery was nearby and the monks would come to the Harangi Dam’s Backwaters for an outing. As we walked by, the football landed near me. I passed it back and the monks offered me and my two companions mangoes which I happily accepted on everyone’s behalf. 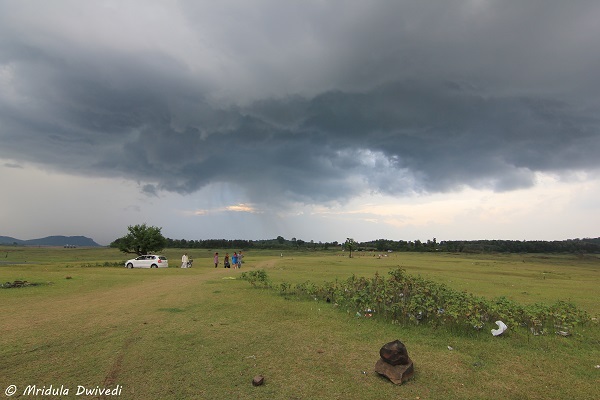 As we walked to the edge of another water body, the weather turned dark. With a lot of reluctance I started walking back. Mid way it started to rain. Nagraja and his friend ran back. I gave them my bag with the DSLR. I was happy to get wet with my water proof cell phone! I got nicely drenched on my walk back. The monks also packed up along with the football players. They even took the goal posts away! As soon as I got in and changed, the rain vanished leaving behind a most glorious evening sky! After a heavy dinner (which was a repeat affair as lunch) it was time to crash in my cozy bed room. 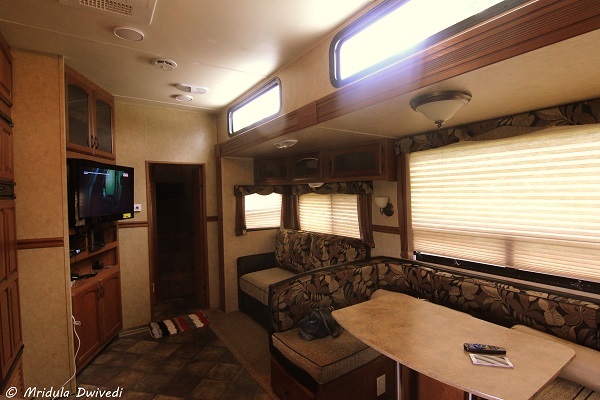 I was alone inside the RV. I was cautioned both by Nagaraja and Narayan to lock the door properly and not to open it. If they would need anything, they would call me on my cell phone and only then come. While I was about to crash at 9.15 pm my fellow blogger Indrani called me. She too has visited the place (as has another friend Shrinidhi) and she asked me if I was all alone! Thankfully I am used to staying in open spaces and I felt safe all the time. I had a peaceful night, once I fell asleep after 10.30 pm I woke up only when it was bright daylight! I am left wondering that if I enjoyed staying in a stationary Camping Van so much, what would happen if I got to be in one that was moving from place to place! My Camping Holiday with Sai Vishram was a smash hit!